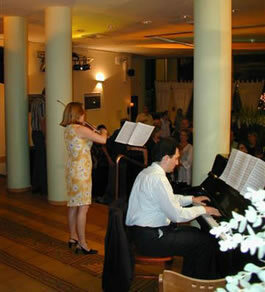 Duo Rigaudon can play in any venue with a piano: church, hotel, piano bar or even a private home. If you are looking for jazz standards as background music for a cocktail party, a concert performance of Beethoven’s sonatas for piano and violin, or anything in between, Duo Rigaudon is a brilliant and cost-effective solution. It has music for all events: weddings, corporate, home concert, etc. The duo can be booked together with another Rigaudon ensemble as a part of a package: please ask for more advice on this if needed. As the list below shows, Duo Rigaudon’s repertoire is extensive and varied. We will tailor an imaginative programme to suit your event. If you don’t see specific pieces or songs you are looking for, we are happy take requests and write new arrangements for an additional fee. Our goal is to create an atmosphere that is both unique and memorable! Finnish Large selection of folk songs – ask!